Nobody likes to admit that they have failed. This is especially true when it comes to your professional relationships. Sales positions are highly performance-based, so strong ambition is absolutely necessary to succeed. After all, consistent sales follow-up with your prospects requires discipline and persistence. Succeeding in your profession is imperative for many reasons. Most importantly, it keeps your job and allows you to make a living for yourself and your family. So if you’re in a sales role, not following up with your leads is not an option because it is the key to closing deals and being successful. Although there are several factors that influence your job performance, data shows that most sales professionals give up on potential deals too soon. Countless sales representatives could significantly increase their close rates simply by improving their sales follow-up process. In fact, did you know that 20% of companies’ sales professionals are making 80% of the businesses’ total sales? Here’s the secret to their success: they sell to the prospects abandoned by the rest of their colleagues. The real winners are selling to the prospects others gave up on. Maybe you’re part of the 4.14 million sales professionals who accidentally fell into their profession. In fact, in the United States, 46% of salespeople never intended to pursue a job in sales. 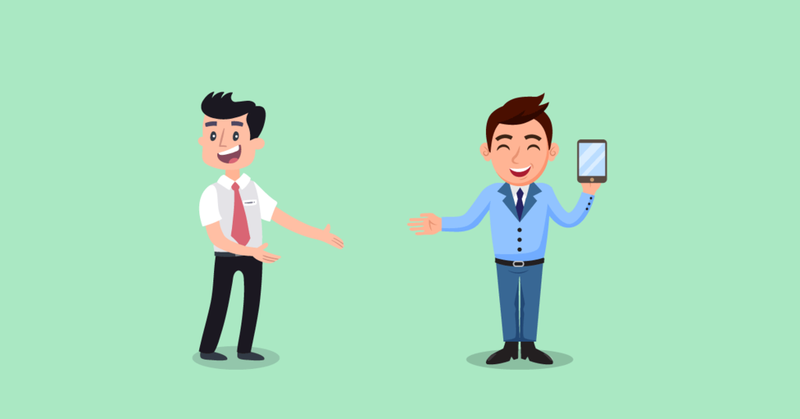 Due to the high number of representatives with little-to-no sales background, many do not know the proper sales follow-up protocol. Many salespeople may even give up on potential leads and get discouraged after one or two meetings. The truth is, only 2% of sales happen at the first meeting. Generally, that 2% only occurs if you’ve been referred by a trusted customer or if you have previously built a relationship with your prospect. The other 98% of sales will happen only if you follow up. Some prospects, like me, are very methodical. These people search every corner of the internet to learn more about your company and the services you provide before they commit to talking to a sales representative. In other words, these prospects are already in the consideration or decision stage of the buying process. This is goods news for you as a salesperson because these prospects are more aware and informed about your company, product or service at their first point of contact. Therefore, they are likely to fall into the 2% of leads that close on a first meeting. What about the other 98% of prospects? They’ll require some trust building and persistency. The question that begs an answer is this...how much sales follow-up is enough. First of all, you should never give up. Let that be a motto you live your life by, especially if you’re in sales. With that being said, 50% of all sales happen after the 5th contact, but guess what? The large majority of sales reps give up after only two follow-ups. If you’re one of those salespeople, then you’re leaving a lot of deals on the table. The good news is that there are specific sales follow-up strategies that smart salespeople utilize to close even more deals. I’ll share more on that shortly. If you learn anything from this article, know that persistence pays off. In what ways? Simply put, more persistence leads to more sales, and more sales equals more revenue. Hopefully, for you, that means more commissions, bonuses and promotions. That’s all great, but that is not the only way it pays off. Persistence will produce more quality conversations and a healthier sales pipeline that will increase the probability of your company hitting its revenue goals. This is because according to a Hubspot research, there’s a correlation between the number of opportunities produced in your sales pipeline each month and overall quota attainment. In fact, 72% of companies with less than 50 new opportunities per month didn’t achieve their annual revenue goals. This is compared to 15% with 51-100 new opportunities and 4% with 101-200 new opportunities. So if you want to increase your chances of hitting your revenue goals, then focus on increasing the number of new conversations you’re producing. New conversations lead to more opportunity, more opportunities lead to more sales and more sales equal more revenue. I’m sure you can now see why no sales follow-up is not an option. Now, I want to share with you three of the best methods to follow up with your leads so that you can close more deals. Leads and deals? That just sounds beautiful. Let's go! The oldest and most traditional form of these three methods are phone calls. Earlier in this blog, I mentioned how some people, like myself, are very methodical and want to know everything about your product before they speak with a salesperson. With that said, not everyone is the same. In fact, 19% of buyers want to talk to a sales representative during the awareness stage of the buying process, which is when they’re first learning about a product. If you’re cold calling your prospects, it will take 8 cold call attempts to reach them. This is because 72% of calls aren’t answered, according to Baylor University. After you have established the first point of contact with your prospects, the sales follow-up process begins. For 80% of your prospects, you’ll have to follow up more than four times. Why? Well, they’ll say no four times before they say yes. 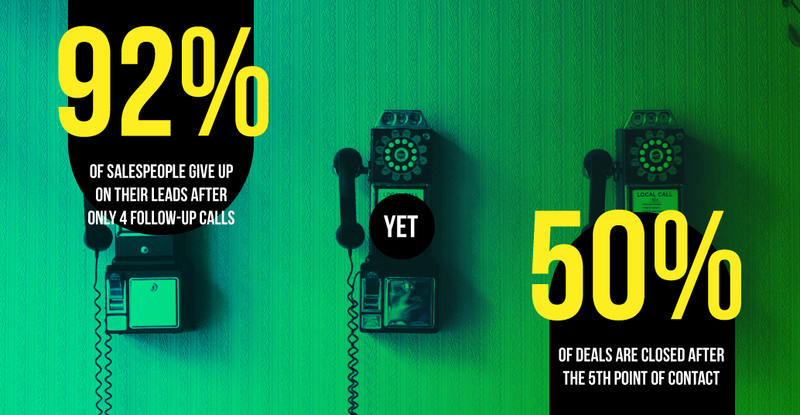 If your sales follow-up with your prospects goes past a 4th call, then you’re already ahead of 92% of salespeople who give up after their 4th call. You might ring your life away for weeks and months, but picking up the phone is not your only option here. There are other methods to create more points of contact in a shorter period of time. Up next, we’ll discuss the use of emails. If you’re doing any kind of sales follow-up, it’s likely that emails are your first choice. Emailing prospects is quick, simple, and quite frankly, it requires minimal effort once you’ve come up with a winning template. Although convenient, unfortunately email open rates are a real sale killer. Depending on your industry, open rates for business emails range from 13.40 to 28.02%, according to the latest data provided by Constant Contact after analyzing over 200 million emails. Mailchimp recently did a similar study where they analyzed their customer data and it revealed business email open rates ranging from 14.92 to 27.35%. The average open rate for all industries they analyzed is 20.8%. I know what you’re thinking, what about cold emails? With a well-executed strategy that includes personalization, audience research, highly targeted lists and messaging directed at your prospects pain points, it is possible to achieve significantly better open rates. In a study conducted by Fast Company, with a pool size of 1,000 high-profile prospects, they were able to achieve 45.5% open rates after 293 emails bounced. Their response rate from the 707 emails that were sent was 1.7%, that's only 12 people. When you send emails, don’t join the other 70% of salespeople who stop following up after sending just one email. Send sales follow-up emails! According to YesWare, you are increasing your chances of hearing back from your prospects by 21% with a second email and 25% with a third. Does your sales follow-up strategy include emails? If it doesn’t, it should. However, that does not mean it should be the only communication channel you’re leveraging. Up next, we’ll talk about the use of text messaging. Always save the best for last, but not when it comes to your sales follow-up strategy. You can, however, save the best for last on your blog post as I did just now. Text messaging is the most underutilized communication channel by salespeople today, but it is the most effective and time efficient. It is also surprising because 78% of consumers which they could text businesses. Why not meet them where they are and give them what they want? I can’t think of any reasons not to. When it comes to sales, everyone seems to focus on when is the best time to reach your prospects and leads. To answer that question, according to Lead Response Management, the best time to contact a lead is 4:00 to 6:00 pm on a Thursday. There’s only four Thursdays and an 8-hour gap that represents the best window of opportunity in any given month. That’s not a lot of time, especially when you consider that it takes multiple points of contacts to close a deal with 98% of your prospects. The good news is that this same study revealed there’s actually a better time to contact your leads...five minutes after their inquiry. We live in a low attention span economy where the absence of instant gratification will result in missed opportunities and lost sales. The problem is that only 7% of salespeople respond within five minutes of an inquiry. The solution to overcoming this common problem is text messaging. You might think that a response within a five-minute window is extreme and you don’t have the resources to deliver that type of service, but there’s a way you can set up text messaging auto-replies. A quick reply may not solve the problem right away, but it resets the clock and sets new expectations for your prospects and leads. Though five minutes is preferred, if you can keep your response time to at least under an hour, you’ll still be in good shape compared to your competitors. Salespeople who respond to prospects and leads within just one hour of receiving an inquiry are nearly 7 times more likely to have a meaningful conversation with a key decision maker than those who do after the first hour. Regardless of this information, only 37% of companies are responding to inquiries within an hour. Not only is it timely, text messaging is also the best way to build rapport. As it turns out, 18% of customers don’t trust and respect salespeople to begin with. As a business reaching out to prospects that have never heard of you, there's a lot of work to be done. The kind of work that is consuming of time and sometimes even exhausting if you're not leveraging the proper sales follow-up method. Instead of being a salesperson who spends 66% of their day in administrative tasks, be one who spends more time talking to people and you will experience greater success. At ReplyBuy, we’re about enabling businesses to build stronger relationships with their prospects and customers. Our peer-to-peer texting platform allows salespeople to have meaningful conversations that lead to more sales at scale. Start leveraging text messaging today, close more deals, outperform your peers and outplay your competitors. Learn how ReplyBuy can help you attain your quotas and reach revenue goals faster.